Today is a typical April day, “April showers”, heavier than it looked from indoors, so my venture out only resulted in a wet top before I decided that today was not the day to be gardening. Because we have some semi-residents we decided to take some of the netting off the pond so that they could get in properly. Three ducks appeared one day on the grass and as the pond was covered with bean netting, the large hole stuff so that small birds could get through to the water, but not the Heron, the ducks managed to force their way in, but got tangled a couple of times getting out! There is obviously a pair of Mallards and another drake, which we think is their youngster from last year. Talk about teenagers hanging on when they should have left home! He get chased away by the older drake, but doesn’t go far. 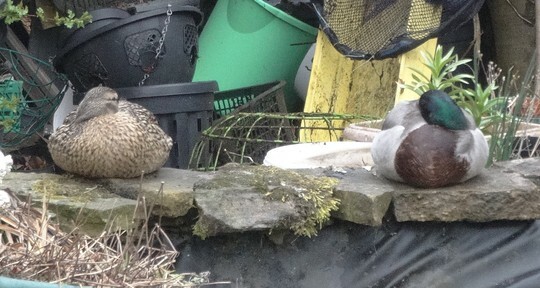 If you can ignore the background of this photo – it’s the heap of pots and ‘useful’ stuff that is hidden from sight apart from this angle, this is the duck and drake. The duck decided to lay her eggs behind the huge Crinum powellii which is at the end of the bungalow. This always has all the old foliage left to protect it through the winter, so of course her choice stopped me tidying this up. She laid 4-5 eggs in there and then one day when she wasn’t on the pond with the boys and wasn’t in there, I discovered that there was only one egg left and she had deserted the nest. What took the eggs, I have no idea, we have so many predators about here that could be the culprits – Stoats, Hedgehogs, Magpies etc. 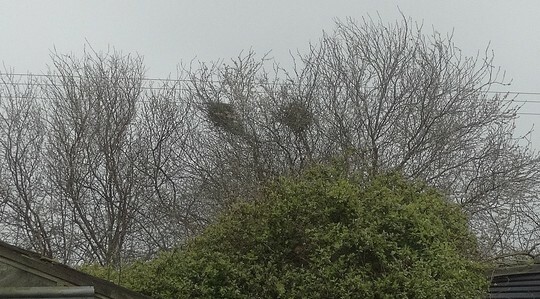 This is the last year’s nest and this year’s nest of the Magpies in the top of the wild Cherry Plum tree (before it was in leaf). 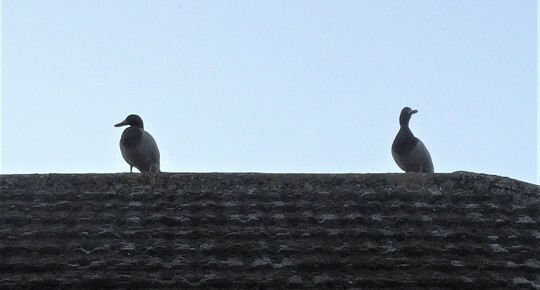 The ducks roost during the day on the bungalow roof, which seems really weird to see a duck as an ornament on the roof. The female is obviously nesting somewhere close as she is missing most of the day, the boys sit quite happily together while they are alone, otherwise it is a pair and a single! She appears for a wash and brush up and then is off again. They have got so tame, so quickly perhaps as OH will put corn, cake and bread down for them – so much for me picking up food trays from the chickens, geese and peacocks to prevent rats, when he is leaving food out! Of course by taking off one row of the netting meant the Heron quickly spotted the opportunity and there he was standing in the pond! Back out to string the areas that he could stand in and I haven’t seen him since. The edge of the pond is covered with flowerpots to prevent him landing there and I have bought some trailing plants to make it look a little less like a junk yard around the pond. I shall still have to put some sticks in the boxes to prevent the drakes sitting on them as one tray of trailing succulents was completely obliterated by the young drake plonking himself on the top. Now recovering as it’s full of sticks! They don’t roost here anywhere and fly off to wherever and appear again in the morning. In a fit of optimism I bought a tray of trailing Lobelia, but will have to find a spot out of sight and reach of the Peacocks as they love it! Also bought Petunias and creeping Phlox as they don’t eat the Phlox, not so sure about the Petunias. Because of my desire to have drifts of Aubretia and no chance of growing it here for the above reason, I bought two of them and put them in hanging wall brackets, hopefully to have at least a couple to admire. Where the female duck is nesting, who knows, and also whether she is going to walk them here when they hatch, I will keep you up-to-date! What did I just say about not seeing the Heron again?? Just this minute finished this blog, walked through to the kitchen and there on the pond he was until he saw me! Previous post: Can we now say it's Spring? Oh Honeysuckle! lol...the trials of tending to wildlife eh? You yearn for them to visit your garden, but when they do, its nothing but strife and anxiety! What a lovely blog. Really enjoyed reading it. As you say, funny seeing the ducks on your roof. Do hope for you that mother duck does bring her ducklings to come and visit you and look forward to the update if she does. ? Oh Honeysuckle, what a battle you have on your hands! 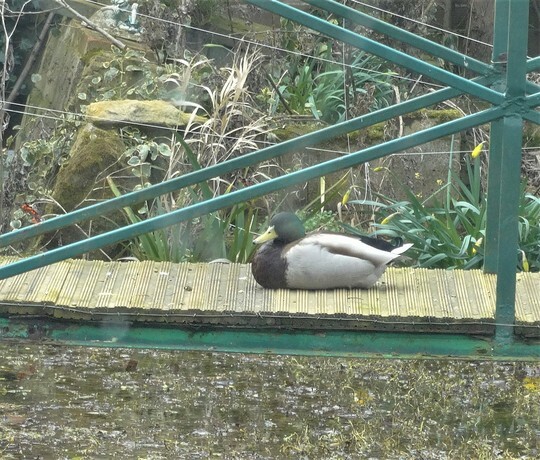 Ducks are awful mothers & drakes will kill the young in my experience, that's why she has to go off to nest & lay her eggs. I'm having a battle already Greenfingers! 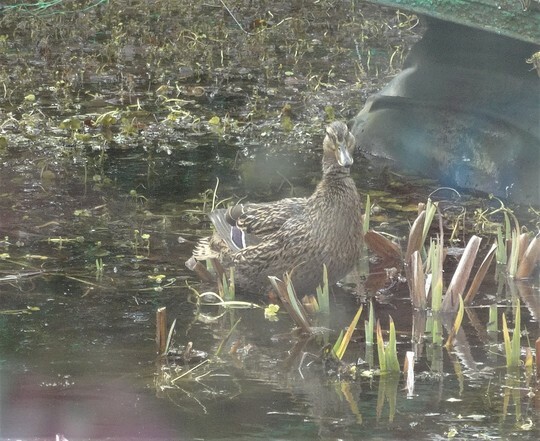 Because we wanted to let the ducks on the pond we removed some of the netting, only to find that the Heron had discovered that too. The sides of the pond have planters all along it to deter anything landing. These are all new and matching as I thought it would look better, planted up and had small garden sticks put in them to stop the ducks sitting on them - hasn't worked as there is one at this moment who has worked his way between the sticks and is sitting on the plants! I didn't think ducks were a problem with looking after their young, perhaps only if they are in a confined space? I don't think ducks & gardens really go together. I used to keep a pair of Aylesbury's, they had free access to about 3/4 acre including the pond & a small river, strangely they never went in the water but preferred to dibble in a trough. They made a terrible mess of my herbaceous borders though with their paddle feet they flattened everything. The wild ducks were the bad mothers mainly because they have to go off away from the drake to nest & depending on how far they go drag the chicks back to water through wet grass & they often get chilled & die or else they cannot keep up with mother & end up lost.